In the 1970s, at least four companies manufactured three stage snow blowers: American Machine and Foundry, Craftsman, Lambert and Lombard. Three stage snow blowers are no longer manufactured, but vintage models circulate at specialty collection and antique dealer websites. A two stage snow blower features an auger and impeller shoot. Modern snow blowers are single stage or two stage, depending on the design of the machine. Single stage snow blowers break up snow with an auger, or a horizontal corkscrew, which breaks up and disperses the snow in one sweeping motion. Single stage snow blowers are smaller than their counterpart, the two stage snow blower. A gas or electric single stage snow blower removes snow buildup from small to medium properties in both residential and remote locations. As its name suggests, a two stage snow blower requires two steps to remove and redistribute snow. The first stage is similar to the single stage snow blower; an auger breaks up and feeds the snow into the machine. The snow is fed through an impeller, or a vertical or horizontal chute, which blows the snow out of the machine. Because a two stage snow blower uses air to blow out the snow, most companies refer to dual stage models as snow blowers, and single stage models, snow throwers. 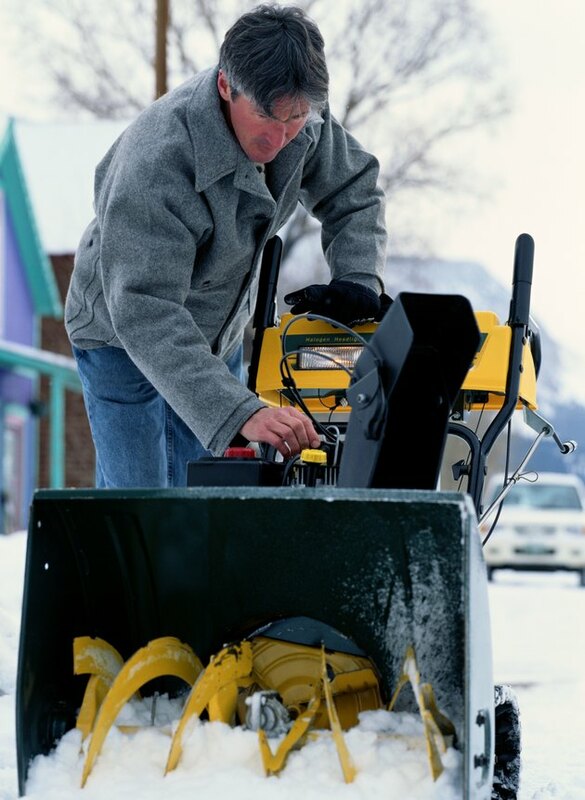 Gas-powered dual stage snow blowers cover large areas and can handle difficult or icy terrain. Like two stage snow blowers, the three stage snow blower uses an auger and impeller system. A three stage snow blower, however, includes a second auger above the main auger. The additional auger assists in snow breakage and helps disperse the remaining snow into the impeller chute. The style and shape of the dual auger system varies by manufacturer. At least four manufacturers developed three stage snow blowers in the 1970s. The American Machine and Foundry model featured a disk auger, while the Craftsman offered a bar. Lombard models used identical, double auger systems, and Lambert models featured a second auger at the top of the snow-removal bucket.